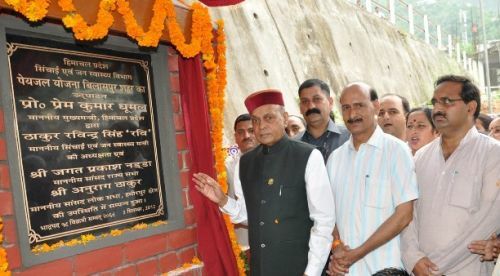 Chief Minister Prem Kumar Dhumal laid foundation stones and dedicated developmental projects worth Rs. 29 crore to the people of Naina Devi Ji Vidhan Sabha segment in Bilaspur district today. Chief Minister performed foundation stone laying ceremonies of three Rain Water Harvesting structures over Ghambhrola khad to be constructed at a cost of Rs.3.49 crore at Nauwa, Parohi and Khui, Wayside Amenity at Ghambhrola to be constructed at a cost of Rs. 49.50 lakh, Lift Irrigation Scheme Tanbol-Jagatkhana to be constructed at a cost of Rs. 11.24 crore which would provide irrigation facilities to 292.44 hectare area, Trauma Centre to be constructed at a cost of Rs. 79 lakh at Swarghat. He also inaugurated the new Development Block besides Tehsil Office Building at Swarghat constructed at a cost of Rs. 1.38 crore. Addressing a public meeting at Swarghat, Prem Kumar Dhumal said that State Government had ensured balanced development of the entire State and added that developmental schemes to benefit every section of the society were launched. He said that Rs. 353 crore ‘Pandit Deen Dayal Kisan Baagwan Samridhi Yojna’ was launched to strengthen the economy of the farmers under which 1.69 lakh polyhouses were constructed in the State. He said that this was one of the best scheme in the entire country under which 90 percent subsidy to BPL families and 80 percent subsidy to others was being provided. He said that the rural people have been benefited immensely by Rs. 300 crore ‘Doodh Ganga Yojna’. He said that the State Government had enhanced the price of the milk upto Rs. 10 which was Rs.18 per litre now. He said that one veterinary dispensary had been opened in every panchayat to facilitate the farmers. Prof. Dhumal said that ‘Atal Awas Yojna’ had been started in the State in addition to ‘Indira Gandhi Awas Yojna’ under which an assistance of Rs. 48,500 was being provided to beneficiaries and added that an assistance of Rs. 15,000 was being provided for house repair to these beneficiaries. He said that four CFL bulbs were provided free of cost to every domestic consumer under ‘Atal Bijali Bachat Yojna’ which saved electricity worth Rs. 110 crore. He said that ‘Atal Swasthya Yojna’ had been started in the State under which ambulance service was available in emergency within half an hour. He said that free treatment facilities were being provided to new born infants upto one year in Government hospitals besides free institutional delivery facility to expectant mothers in Government hospitals. Chief Minister said that interests of employees had been protected and added that financial benefits worth Rs. 75,000 crore were provided to them by the Government. He said that the daily wages of the workers were Rs. 75 in 2008 which was enhanced to Rs. 150 by the present Government. Prof. Dhumal said that education sector had been strengthened by making the State an Education Hub, so that students could get higher educational facility at their door steps. He said that net books were being provided to the students alongwith scholarships to meritorious students and added that ‘Atal School Uniform Scheme’ had also been launched under which free uniforms twice a year alongwith Rs. 100 stitching charges were being provided to the students. Chief Minister said that the State Government was providing employment to unemployed youth and added that 40,000 youth were provided employment in Government sector by the present Government whereas the previous Government had provided employment to only 3386 persons. He said that the Central Government was discriminating the State in every sphere by denying the legitimate share of the State in various schemes. He said that the former Prime Minister Shri Atal Behari Vajpayee had provided industrial package to the State which was also curtailed by the Centre. Prof. Dhumal said that the State had demanded Rs. 150 crore for maintenance and repair of National Highways in the State but only Rs. five crore were sanctioned. He said that the State Government was undertaking repair works of Highways out of its own resources to ensure smooth vehicular traffic. Chief Minister announced also announced to upgrade Government High School, Swarghat to Government Senior Secondary School. He also released a book ‘Kahloor Ki Kahani’ authored by N.R. Hiteshi. Earlier, Chief Minister also inaugurated the Water Supply Scheme at Bilaspur constructed at a cost of Rs. 5.88 crore. Randhir Sharma, local MLA welcomed the Chief Minister. He said that 325 handpumps were installed in the area during the tenure of present Government whereas mere 74 during the tenure of previous Government. He said that Rs. 60 crore spent on various water supply schemes in the area by the present Government whereas mere Rs. 6.70 crore during the tenure of previous Government. Ravinder Singh Ravi, Irrigation and Public Health Minister, Ritesh Chauhan, Deputy Commissioner, senior officers and prominent persons of the area were present on the occasion.